The Inspirations Awards celebrate a firm’s commitment to corporate social responsibility within the commercial interiors sector of the architecture and design industry, recognising projects that have had a positive impact on those in need. 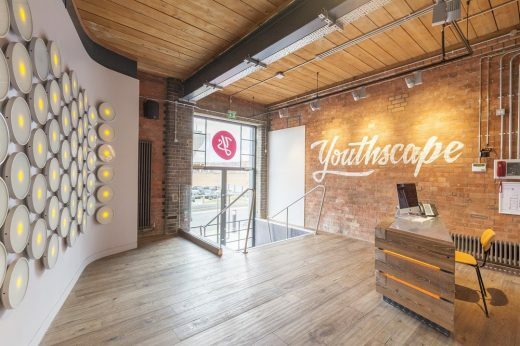 Youthscape, a charitable organisation that helps disadvantaged young people through counselling and training, had outgrown its former office space and enlisted HOK’s London office to design a relaxed and healthy environment for its young people, staff and volunteers through the refurbishment of a 100-year-old former steam mill in Luton. Bute Mills was completed as part of the HOK “24 / SIXTY” community service initiative to commemorate its 60th anniversary in 2015. HOK’s leaders challenged each office to donate at least 60 hours of design services to a charitable initiative. As an extension of this, HOK staff worked on a not for profit basis for over 1,000 hours, 350 of which were donated to the charity pro bono. The completed Bute Mills project enables Youthscape to offer new training programmes and help more young people, with the potential for the development to become the first in a series of similar projects across the UK. The organisation will receive a US$2,000 grant award from sponsor Tarkett. Youthscape and HOK were honoured at the Inspirations Awards reception on June 11 at NeoCon in Chicago. The Luton based building will be a national hub for innovation in youth work. 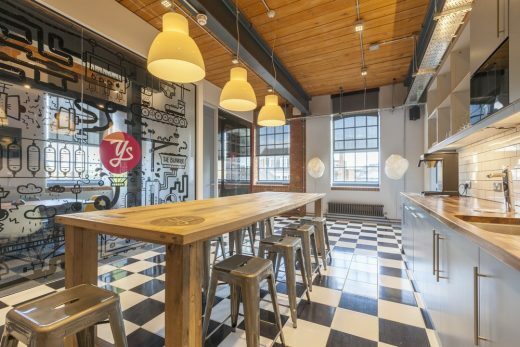 HOK’s London practice has provided design services to transform a historic industrial building into a 10,000-sq.-ft. headquarters and youth centre for UK charity Youthscape. 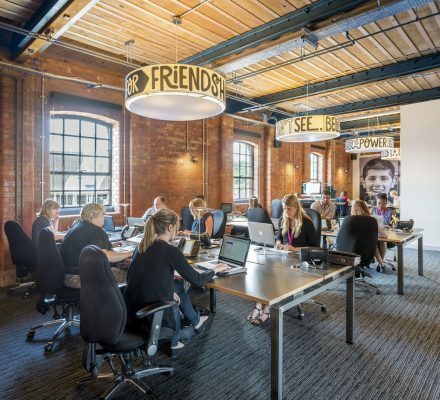 Having outgrown its former office space, the charity – which helps disadvantaged young people through hands-on counselling and training – enlisted HOK’s help to refurbish Bute Mills, a 100-year-old former flour mill in the centre of Luton. The charity recently moved into Bute Mills following the launch of the building, which was attended by the Archbishop of Canterbury in November 2015. The renovated centre expands Youthscape’s capacity to develop new programmes and enables it to serve more young people. The charity predicts that the facility will become a national hub for innovation in youth work, encouraging youth workers and teachers to collaborate and inspire new ways of assisting young people. The adaptive reuse project took three years to complete, which included 380 hours of pro bono architectural and interior design services donated by HOK’s London office. Renovations include a new interior design layout and furniture, as well as new heating, electrical & plumbing systems, insulation, entrance doors and significant structural work. 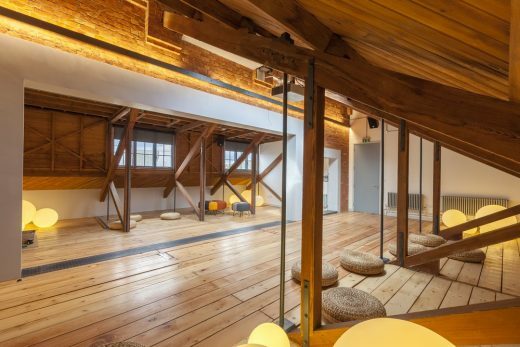 • Large roof space dedicated to group counselling. HOK designed all of the spaces to create a relaxed, informal environment that promotes effective training, education, social and counselling activities. Graphics and photography also play an important role, reflecting the brand and reinforcing the Youthscape messaging. The team used sustainable design strategies to create a healthy environment for the charity’s young people, staff and volunteers. Several energy conservation features, such as natural ventilation, reduce operating costs. Timbers that were removed from the roof to help open up the space, were reused both in the new reinforced structure and in the creation of the Ground floor reception desk. The team specified Forest Stewardship Council-rated timber flooring, low-volatile organic compound products including water-based paints and low-energy, light-emitting diodes (LEDs). 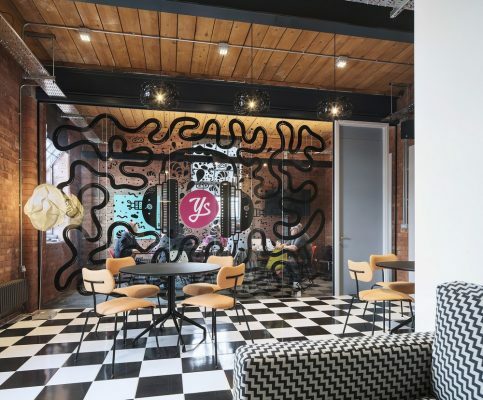 “Not only has HOK produced a brilliant design, but the team has brought on board many other designers, engineers and suppliers who have been extremely generous with their time, expertise and products,” said Fiona Green, Youthscape project manager and Luton Borough councillor. 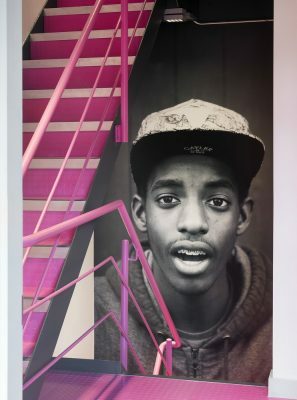 A specially commissioned feature wall by Jason Bruges Studio provides a distinctive arrival experience in Youthscape’s ground floor reception area. The feature wall, which makes reference to Luton’s heritage as a centre for vehicle production, incorporates car parts, sourced from a local manufacturing company, that light up in response to movement within the reception space. 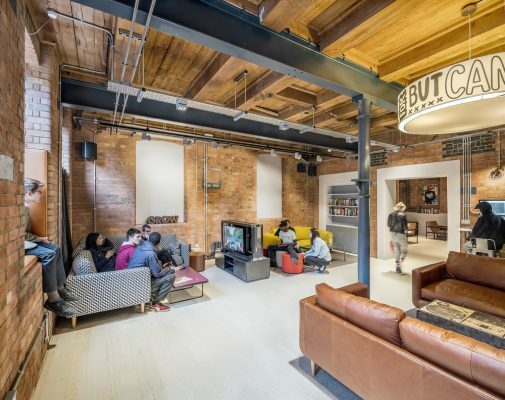 The importance of the project was also appreciated by one of HOK’s clients, publishing group Hachette UK, which donated books to populate the building. HOK assembled the consultant team, which included: Main Contractor, Structuretone; Structural Engineer, Simpson Associates; Project Manager, Tower 8; and Cost Consultant, Core Five. Mechanical and electrical consultancy was provided by Troup Bywaters + Anders. The project was completed as part of the firm’s HOK 24 / SIXTY community service initiative, in which, to commemorate its 60th anniversary in 2015, HOK’s leaders challenged each office to donate at least 60 hours of design services. With some projects continuing into 2016, HOK’s people in 24 offices will have contributed over 4,000 hours—2,500 more than the initial goal. The new HOK 24 / SIXTY report illustrates the firm’s commitment to making a difference. HOK is a global design, architecture, engineering and planning firm. Through a network of 24 offices worldwide, HOK provides design excellence and innovation to create places that enrich people’s lives and help clients succeed. Design Intelligence consistently ranks HOK as a leader in sustainable, high-performance design and technology innovation.